Big Pharma, 2016, 26X48” Medicine cabinet, test tubes and stoppers, assorted pills, mirror, prescription bottles, black and white portraits, and encaustic on board. It is legal in the United States for pharmaceutical companies to market directly to consumers, and it’s also legal for them to give physicians financial incentives to prescribe specific drugs. In the 1990s pharmaceutical companies and the medical establishment argued that opioids could be used to treat chronic conditions without addicting patients. Sales of the drugs exploded, rising to nearly 10 billion in 2015, from 1 billion in 1992, according to IMS. Complicating this conflict of interest is the consuming public’s undying faith that drugs can provide relief or cures for every ailment. The demand is high. According to the 2010 National Survey on Drugs Use and Health, an estimated 2.4 million Americans used prescription drugs non-medically for the first time in that sample year. This averages about 6,600 initiates per day, of which one-third are 12 to 17 years of age. For children ages six to sixteen, entry drugs include common over the counter medicines such as cough and cold medicines; young adults and adults are frequently snared in over prescribed, highly addictive painkillers containing opioids. For most people, access starts in the home medicine cabinet, not the street. 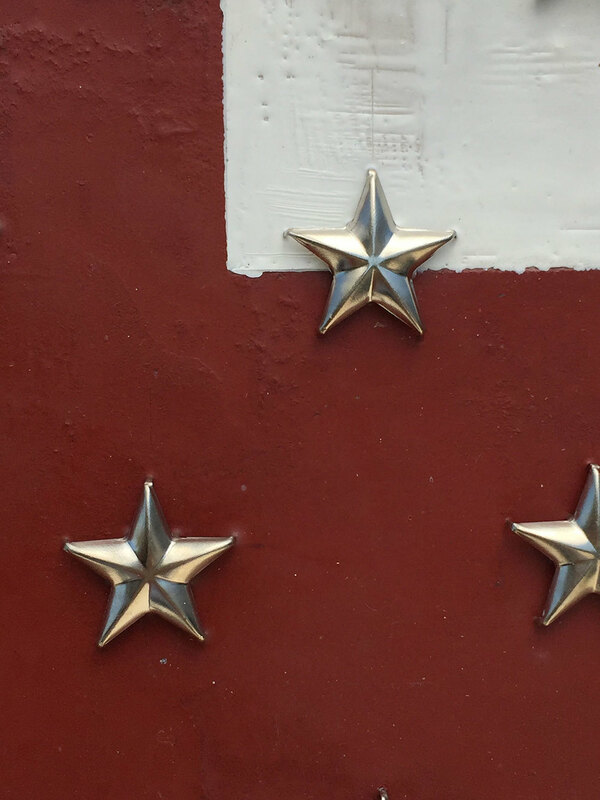 50-metalic stars are tenuously attached to the face of a medicine cabinet covered with a red cross and gauzy-white encaustic background. 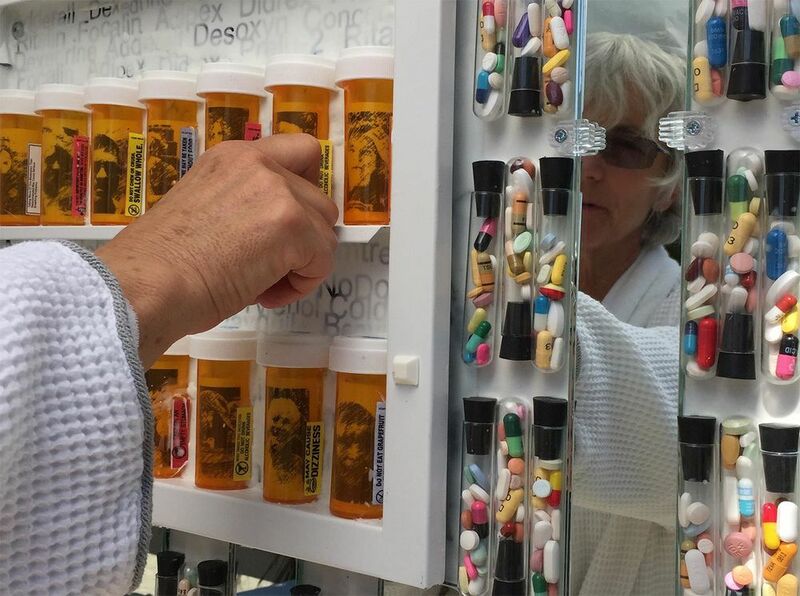 When opened, shelves of the cabinet are neatly lined with prescription bottles that contain faces of people whose lives have been altered by prescription medications appearing in the type lining the cabinet rear. The physician medical symbol is scratched into the surface of the inside face of the cabinet door, a reminder of the Hippocratic Oath that doctors take to uphold ethical standards. 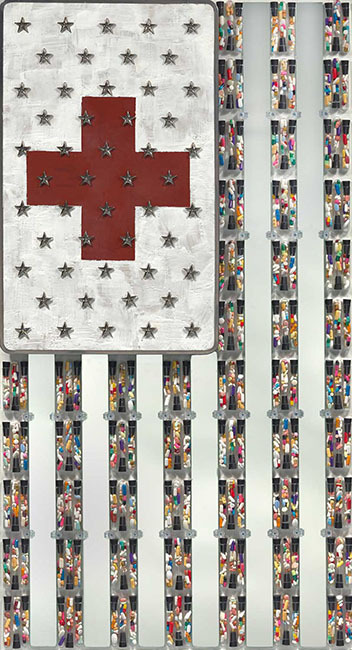 The flag stripes alternate between mirror that reflects the viewer and suggest that anyone is vulnerable with stripes of pharmaceutical, medical grade test tubes that represent the research, development, and marketing of all sorts of drugs that are readily available to consumers.